Sydney is a dynamic, cosmopolitan city which enjoys a relaxed lifestyle, great weather and spectacular scenery. This, combined with its history, sporting tradition, entertainment, high standard of living, excellent health care and education, makes it one of the top destinations in the world. Australia may be English speaking but it’s not the US with kangaroos. Expats and visitors have described it as being more like the UK with wombats. Sydney does have a very British feel to it which is hardly surprising given its history. People move here to enjoy the outdoor life, a good standard of living, a thriving arts and culture scene and lots of sunshine. Sydney has often been described as the ‘New York of Australia’. Both cities buzz 24 hours a day. They both have a great work ethic but know how to work and play successfully. Inhabitants of both cities are rightly proud of where they live. Life in Sydney is little slower than New York, with more time spent outdoors in the parks and on the beach. This has a lot to do with the amazing 300 days of sunshine per year in Sydney compared with only 107 in New York. The Expatistan Cost of Living Index for January 2017 puts the cost of living in Sydney as 21% cheaper than living in New York. Also, remember the minimum wage in Australia is almost twice that of the States. 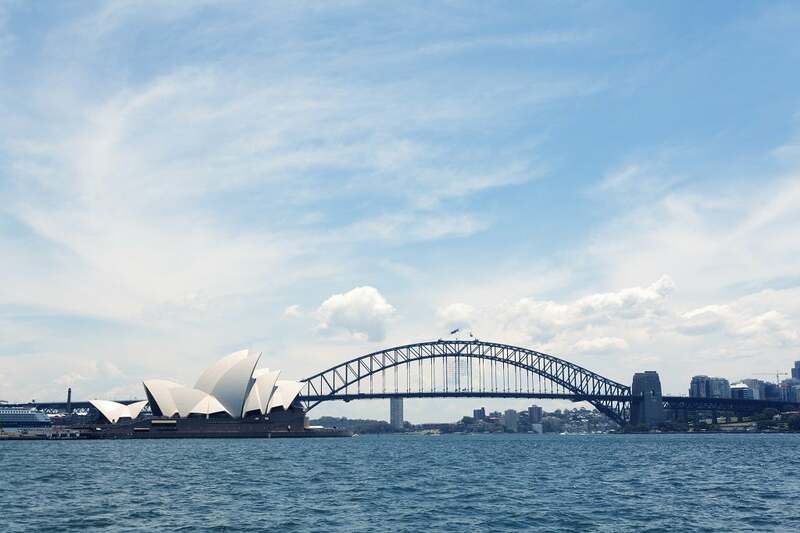 Residents of Sydney can enjoy a high standard of living on far less than those living in New York, due to higher salaries. Like most cities in the States, Sydney is a city of house and flat sharing. Accommodation is expensive and there is a shortage of it. You can expect to pay $3,770 for a 900 sqft flat in a good area, close to the CBD or Bondi and $2.980 for the same space in other areas such as Chippendale. Utilities for two people will be around $200. These rental prices are 33% and 42% higher respectively in New York. The average price of a house in Sydney is $750,000 but the prices vary enormously depending on the area. You can start at around $300,000 in far out suburbs like Parramatta and go up to hundreds of millions in suburbs on the water. Sydney has excellent public transport consisting of buses, trams, trains and ferries. A monthly transport ticket costs $118 – slightly cheaper than the equivalent in New York. Petrol is $0.91 a litre, making it cheaper than the States. Taxis are around 20% cheaper in Sydney than in the big cities of the States. Sydney is often described as a series of villages, each with its own character. It has over 500 suburbs, so the choice is great. Every suburb has at least one park to relax and picnic in. There is plenty of student accommodation near all the universities in Sydney. Sydney University is in the up-and-coming suburb of Redfern and is full of bars, coffee shops and restaurants. Manly Vale is a favourite area for families and retirees alike, with excellent schools, child-friendly activities and great shopping. Bondi is another family friendly area as it’s close to the beach, shops and good schools. Vaucluse is a lovely area right on the harbour which has views to die for. Australia has an excellent free education system and a host of good private schools. Children start school at the age of 5 and follow the Australian National Curriculum. Some international schools offer the International Baccalaureate. You are spoilt for choice in Sydney. There are museums, galleries, saltwater swimming pools, the Botanical Gardens, Taronga Zoo, Sydney Opera House, theatres, cinemas, sports clubs, boating trips, restaurants, bars, cliff walks, snorkel routes, surfing, scuba diving, history tours and shopping, to name but a few of the many activities. Australia is known for its fine dining and excellent wines. Sydney has an incredible array of restaurants from basic diners to top award winning restaurants. Eating out, having coffee or enjoying a glass of wine are very much part of life in Sydney. Regular visits to Circular Quay are a must for Sydneysiders and visitors alike. The selection of eateries is endless and, with views of the Harbour Bridge and the Opera House, you can’t fail to enjoy your dinner. Why not try dining at Bennelong at the Sydney Opera House? It was voted best new restaurant for 2016 and holds a coveted 2 hat award. The average price of a 3-course meal for 2 with wine is around $204. If this is a little expensive for your taste, then head to the local pub where you can get good pub grub for around $36 for two. There are hundreds of medium priced restaurants to choose from, encompassing menus from around the globe. The average price for a three-course meal with wine at an Italian restaurant will set you back around $85. For those of you who are looking for a good burger, try Mary’s in Newtown, near Sydney University. It’s one of the favourite hangouts of international students and backpackers. There are many vegetarian, vegan and raw food restaurants in Sydney. If you are heading for the beach at Bondi, why not celebrate catching that wave by having dinner at Dandylion. It is fully licensed and a meal for 2 will cost around $65. Let’s not forgot the coffee shops. Sydneysiders take their coffee very seriously and Sundays will see them hopping from café to café, trying out the latest blends. One problem that many newcomers find with Sydney, is ‘lock-out time’. The rules have just been relaxed, but no one will be allowed into venues after 2.00 a.m. and last orders will be at 3.30 a.m. For those used to dancing the night away, especially New Yorkers, this can be frustrating. A beer at a bar will cost between $3.70 and $6.80 and a cocktail anything from $14, depending on the complexity of the cocktail. Sydney’s nightlife is as varied as its cosmopolitan make up. Oxford Street is the heart of the gay community and has a mix of gay and straight bars and clubs. The Rocks and Kings Street have a great atmosphere and are a little more upmarket. Circular Quay and other areas by the harbour are expensive but are always buzzing until the early hours. There are quiet bars and clubs, such as Eau de Vie in Darlinghurst which plays gentle jazz music. Try the Golden Age Cinema and Bar in Surry Hills for some nostalgic glamour and interesting conversation. Sydneysiders are proud of their celebrities but they don’t hunt them down for autographs. A classic example was in March 2016 when Hugh Jackman was on the Bondi beach with his kids. He not only rescued his son from a rip current but also went back in the sea and helped other people in trouble. Russell Crowe has an apartment by the Botanical Gardens, Nicole Kidman lives just outside the city and Cate Blanchett has a mansion on the waterfront. Australia has some bizarre laws. You must remember that you’re in danger of being arrested in Sydney for wearing black clothes, felt shoes and black shoe polish on your face. Also, don’t forget that it is illegal to wear pink hot pants after midday on Sunday in Victoria!